Scotland votes today. As everyone realizes, whether it is yes or no, independence or union, the nation state and body politic in Britain have changed. And the changes have been coming for quite a while. Is this all about nationalism? There has been little reference in the reporting I’ve followed to the old components of Scottish national identity – the heritage of highlands and lowlands with the old heroes and stories so well articulated by the likes of Burns and Scott in the century and a half following the union in 1707. 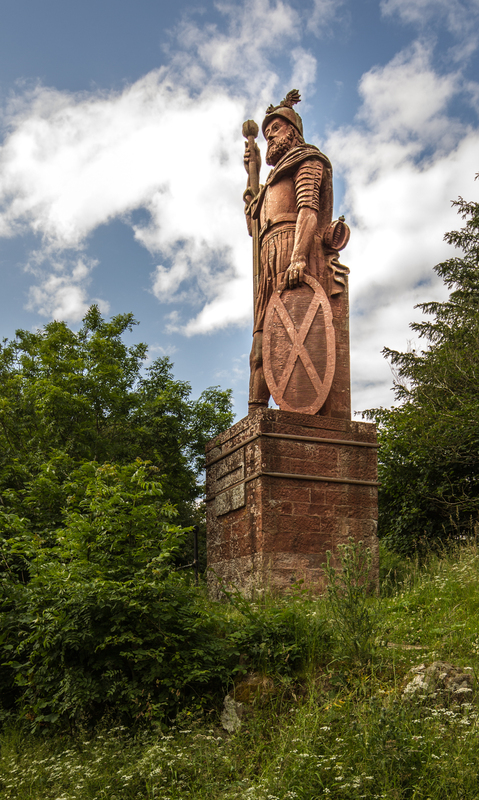 Here’s William Wallace as imagined by the sculptor commissioned by David Steuart Erskine, 11th Earl of Buchan – a thirty foot sentinel looking out over the borders (and on the Bemersyde estate – [Link]). It was unveiled almost exactly two hundred years ago on 22 September 1814 and is the earliest monument to thirteenth-century Wallace, the petty nobleman who mobilized opposition to Edward Longshanks of England’s claim to the Scottish throne. The Earl was something of an eccentric. Passionate about recording and conserving anything to do with Scotland, he founded the Society of Antiquaries of Scotland in 1780. Another antiquary, Walter Scott, complained of the Earl’s “immense vanity” though he shared his dreams of forging Scottish identity out of the remains of historical experience. The “imagined identities” of Scottish nationalism, to use Benedict Anderson’s term, are not the issue. Nobody’s identity is at stake. Linda Colley, Princeton historian, has commented on the volatility of national imaginings so conspicuously missed, misunderstood, ignored by so many Westminster (and Holyrood) politicians [Link]. It’s the character of nation state that is changing, with impulses to find local belonging and the feeling that you matter somehow in a runaway globalist world. Heritage is never a firm foundation for a stable sense of belonging. Disillusionment with government by Tories in London, and with an out-of-touch Labour movement is, as James Naughtie says, a particular manifestation of the wider loss of faith in established leadership that goes far beyond the Scottish question. Now some may say – ah yes but Yes is a rainbow coalition – the very essence of democratic pluralism. But you have to ask yourself with so many groups all tugging in so many directions what makes a separate Scotland any different from the rest of the UK with its democratic conflicts, its mess? Democracy is a daily struggle, an ongoing fight to reconcile differing opinions and ideologies, of contesting facts and plans and shouldering the burdens we inherit from history. It’s hard, it’s exhausting, it’s frustrating and it’s all about compromise. So why do we need to leave the union to engage in this painful process we call democracy? Democratic diversity, so well witnessed in the run up to this referendum, lost in the only two answers to the question posed by all heritage – are you an insider or outsider?